MARTIN KENNEDY began his formal training at Indiana University, where he received Bachelors of Music in both Composition and Piano Performance. He went on to earn a Master of Music in Composition at Indiana University and a Doctor of Musical Arts at the Juilliard School where he was a C.V. Starr Doctoral Fellow. His principal teachers in composition include Samuel Adler, Milton Babbitt, Claude Baker, David Dzubay, Don Freund, and Sydney Hodkinson. His principal teachers in piano include Jeremy Denk and Evelyne Brancart. Kennedy’s music has been performed internationally by numerous artists and ensembles, including the Royal Philharmonic Orchestra, Orchestra Teatro Comunale di Bologna, South Dakota Symphony Orchestra, American Composers Orchestra, Baton Rouge Symphony Orchestra, Wisconsin Philharmonic, Bloomington Camerata, Symphony in C, and Tuscaloosa Symphony. He is the recipient of several prestigious prizes, including the ASCAP Foundation Rudolf Nissim Prize, the ‘2 Agosto’ International Composition Prize, a BMI Student Composer Award, five ASCAP Morton Gould Young Composer Awards, the Suzanne and Lee Ettleson prize, the ASCAP Raymond Hubbel Award, fellowships at the MacDowell and Yaddo Artist Colonies, an Aaron Copland Award, and two Indiana University Dean’s Prizes in Composition. Kennedy also remains in demand as a pianist and collaborator, appearing on concert stages worldwide and such radio programs as BBC’s In Tune and NPR’s Performance Today. He has toured with violinist Lara St. John and flutist Thomas Robertello, with whom he has both recorded with and written for. Kennedy is also committed to the performance of new works, having premiered numerous compositions as both a soloist and as a member of both the Indiana University New Music Ensemble and the New Juilliard Ensemble. Kennedy’s music is available on the Ancalagon, Anbardy, Azica, Centaur, and Riax labels and is published by Theodore Presser Company and G. Schirmer Inc. Previously a member of the academic faculty at Washington University in St. Louis, Dr. Kennedy is currently the Director of Composition and Theory at Central Washington University. For more information regarding Martin Kennedy or his works, please visit his website at www.martinkennedy.com. for Ten Pianos 7:30 10Pno. 20:00 Solo Fl. ; 1 2 2 2 – 4 2 3 1; Timp. 2Perc. Hp. Str. 27:00 Solo Pno. ; 3(Picc.) 3(E.H.) 3 3(Cbsn.) – 4 3 3(B.Tbn.) 1; Timp. 3Perc. Str. for Piccolo and Orchestra 8:00 Solo Picc. ; 2(2nd dbl. Picc.) 1 2 2(Cbsn.) – 2 0 0 0; 2Perc. Hp. Str. for Flute and String Orchestra with Harp 3:00 Solo Fl. ; Hp. Str. for Trombone and Orchestra 10:00 Solo Tbn. ; 2(Picc.) 2 2 2 – 4 2 2(B.Tbn.) 1; Hp. Str. for Orchestra 6:30 2(dbl. Picc.) 2 2 2, 1A.Sax. – 2 1 2(B.Tbn.) 1; Perc. Cel. Hp. Str. for Violin and Orchestra 8:00 Vn. Solo; 3(Picc.) 3(E.H.) 3(B.Cl.) 3(Cbsn.) – 4 2 3(B.Tbn.) 0; Timp. 2Perc. Cel. Hp. Str. It is an extraordinary piece and should find a prominent place with our flute choir enthusiasts. Despite its overall economy, the [flute concerto’s] first movement, a mystical adagio, grows progressively in size and density, a rewarding strategy of delayed gratification. 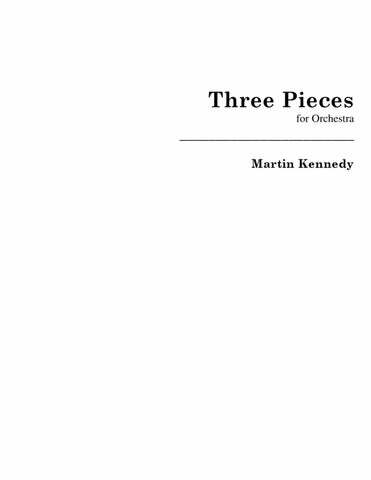 . . Kennedy’s well-constructed, attractive concerto suggests that this young composer has a promising future. 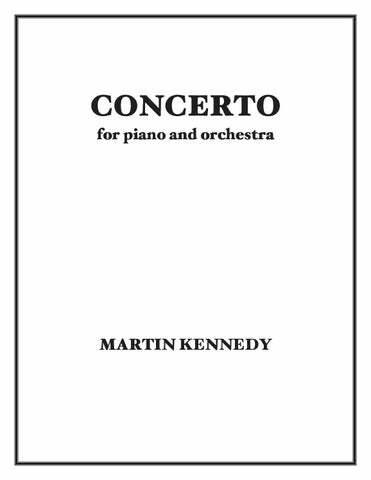 Martin Kennedy’s “Concerto for Piano and Orchestra” harkens back to the bold, sophisticated popular classical American music of the 1940s and 1950s. The piece resounded with the atmosphere of America circa 1950 — jazzy, confident, sleek and grinning. Martin Kennedy’s Desplazamiento is a very frenetic little work that does contain some Latin rhythms and brief references to classical and pop works. These pieces, which effectively make the flute an equivalent of the vocalist, have been beautifully constructed by someone with a musical mind of his own… Throughout, he has given both the pianist, in this case himself, and the flutist, the remarkable agile Robertello, various sorts of challenges that, nevertheless, at all times, serve the cause of music rather than mere technical exhibition. Both composition and performance impressed. [“Four Songs” and “Souvenir”] are sure to become staples of the flute repertoire. …dense with a continuity of eloquence. [Stephen] Gosling was even more powerful in Martin Kennedy’s extravagantly written Theme and Variations [from his Piano Sonata]. Kennedy begins with a lazy theme that quickly swells to Lisztian proportions, requiring heroic keyboard prowess. Its quiet ending, dappled with the faint sounds of an ambulance passing by outside, made Gosling’s sweat and blood feel all the more tangible. The evening opened with the European premiere of an ambitious Sonata that the similarly-aged Martin Kennedy wrote specifically for [pianist Soheil] Nasseri. The Sonata is dense with a continuity of eloquence that flows naturally under Nasseri’s agile, sensitive, and secure fingers. Flutist Thomas Robertello’s pairing of “Souvenir” by Martin Kennedy with the “Fantaisie” by Gabriel Fauré was heart-stoppingly beautiful. Kennedy’s sound world is so closely related to Fauré that without peeking at the program, one would think his “Souvenir” was one of the myriad lovely French salon pieces — no wild technique, just simple beauty — but with an enchanting, fresh touch… I later picked up and devoured a CD of works by both Kennedy and Fauré recorded by Robertello and Kennedy, the composer and pianist. 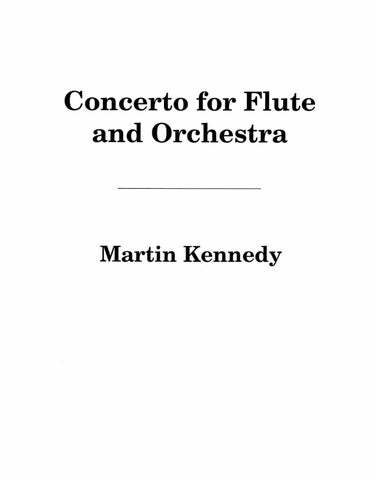 Both Gabriel Fauré’s “Fantasie” and Martin Kennedy’s “Souvenir” provoke precisely that sensation, contrasting the elegiac flute melody with the rhythmic pulse and color of the piano. Fauré’s distinctive French style seems to have been the model for Kennedy’s later exploration of very similar thematic material. …a well-crafted vignette combining blues and ragtime that seemed tailor-made for St. John’s combustible style. …bluesy, bouncy, virtuosic and offbeat with interesting violin lines supported by a solid and sometimes big piano part. 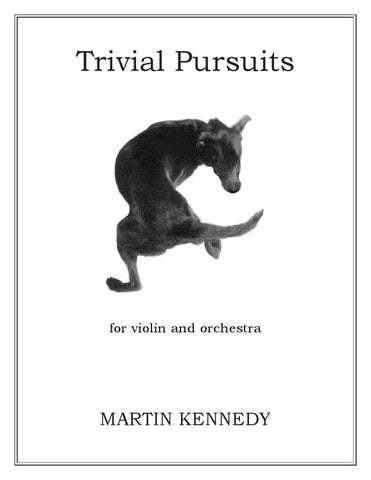 Cleverly constructed in six sections, [“Trivial Pursuits”] starts with a walking bass in the piano and winsomely segues through contrasting sections. Drawing from jazz and blues, it uses [Lara] St. John’s considerable virtuosity wisely. …a brilliant piece with emerging echoes of jazz, set in a solid compositional framework, with the violin engaged in passages of both luminous virtuosity and evocative melodies.